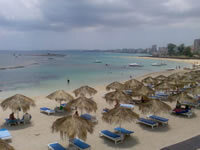 Famagusta City in North Cyprus is another excellent place to visit during your holiday. This is a medieval walled city that has plenty of places to explore and plenty of charm to offer too. Famagusta began with a humble beginning in the 14th century but later grew to be one of the wealthiest trading ports on the Mediterranean. The people who lived here were extremely rich and they built a number of churches and palaces not to mention a magnificent cathedral that was contained within the massive walls that surround this city. Throughout history everyone was always jealous of the wealth of Famagusta and in 1571 the Ottomans invaded the then Venetian ruled city. They spent months bombarding the city with cannon fire but the walls were too strong to penetrate. In the end the people of Famagusta has not option but to surrender to the Ottomans otherwise they would have been forced to starve to death. Under the Ottoman rule the city fell into decline but in 1996 a major restoration project got underway to restore the city to what it is today a lively and buzzing city. If you take a walk around the city of Famagusta you will see evidence of the Ottoman invasion almost everywhere you look. Churches lie in ruins and there is still cannon ball litter evident on the ground. Most of the old buildings have today been put to some modern use and the central square is where most of the action takes place. The old cathedral building is now a mosque and this is where the activity takes place. Modern day Famagusta is much greater that the city of old days. The town is still located around the harbour that attracted the first settlers. Before 1974 Famagusta would have been a very busy resort town which would have attracted the rich and famous to its beaches and hotels but today these hotels lie in the UN buffer zone and the hotel development has been moved to the north of the city. Famagusta is still today an extremely popular destination although most people come here on day trips. It can make an excellent base for exploring North Cyprus though and there are a number of excellent resorts located here too. If you are planning on spending the day here you can view all the old buildings and enjoy a relaxing drink in the little cafes and bars that are nestled amongst these buildings. Just a short distance from the city you will find some excellent golden sandy beaches and there is also the ruin of the Roman town of Salamis. From here you can also visit the Karpas peninsula, and the capital city of Nicosia. It is advisable to have a rental car if you plan to do all this though as public transport is not the best way to travel. If you plan on spending the night in Famagusta there is the Lions Garden Disco which is an excellent night time location.